Welcome to the 2004 CIT. The new doll doll Challenge. The 2004 Challenge will have the expanded theme of Art Nouveau, 1890-1914 to Art Deco 1920 -1930's. Please join this year's fun and complete a doll by July 2004. This challenge began on 2003 as an Art Deco Designer Challenge. It was created by Sherry Goshon, a wonderful artist. 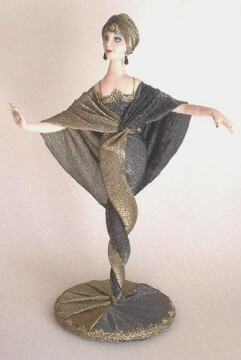 Follow this link to view all the dolls that participated in the 2003 Challenge. To make this edition grow bigger we need you to promote it, and share some inspirational links or information. Do you have more questions? Do you want to ask anything? If you want you can join our Yahoo group. You can also email me.